On Ana: Ba&sh multicolored wrap dress, $565, at Rodeo Drive. On Alex: Jonathan Simkai Green Wrap Dress, $596, at Rodeo Drive. On Alex: Everly White Short, $54, sheer socks, $18, both at Six Sisters. White lace gloves, $35, at Forme Millinery in Mellwood. Sequined bag, $168, at Tunies. Christine Moore Birdcage Hat, $1450, at Rodes for Her. On Anna: Milk & Honey Mustard shorts, $24, and pink and gold fan earrings, $19, at Work The Metal. Straw hat, $480, at Forme Millinery in Mellwood Arts Complex. Veiled Hat, $485, and gloves, $35, at Forme Millinery in Mellwood Arts Complex. She & Sky Red Wrap Dress, $49, at Apricot Lane. Christine A. Moore floral fascinator, $690, at Rodes. Amanda Uprichard blouse, $238, Cinq a Sept Pink Crushed Satin Slip Dress, $395, and Simitri Red Handbag, $225, and LX NYC Jewelry Pearl & Crystal Earring, $83, all at Rodeo Drive. Fascinator, $198, at The Hat Girls in Norton Commons. Acrobat convertible skirt, $236, at Tunies Jealous Tomato blouse, $39, at Work The Metal. Cristina Sabatini Gold Drop Earring, $598, at Rodeo Drive. The Hat Girls Bespoke Collection plexi wide-brimmed hat, at The Hat Girls in Norton Commons. Earrings, $16, at Work The Metal. Sequin jumpsuit: stylist’s own. Gold Festival Hat from The Hat Girls Bespoke Collection at The Hat Girls in Norton Commons. US Jewelry House Geometric Earring, $65 at Rodeo Drive. Hem & Thread Sleeveless Sweater, $44 at Six Sisters. Dear John Snakeskin Printed Skirt, $92 at Tunies. On Alex: Feathered Showgirl Hat from The Hat Girls Bespoke Collection. Alice McCall Denim Jumpsuit, $325, at Rodeo Drive; Dear John Snakeskin Printed Blouse, $68, at Tunies. City Classified Sandal, $22, at Work the Metal. On Ana: She & Sky snakeskin print dress, $45, at Apricot Lane. Streets Ahead White Leather Belt, $150, and Mary Frances Horse Embellished Bag, $295, both at Tunies. Silver Hamsa Choker, $120, at Rodeo Drive. 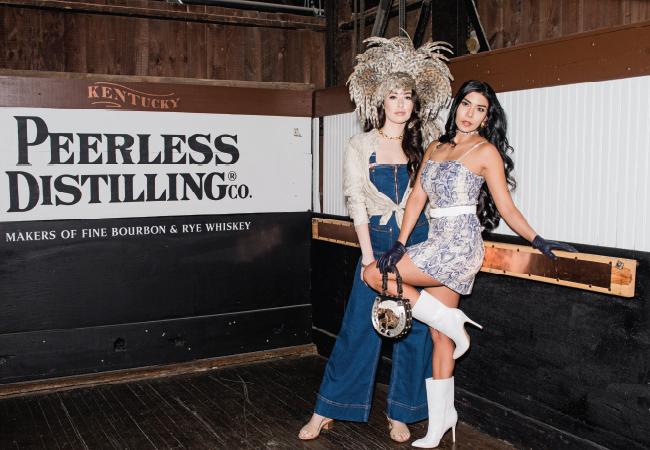 While the world waits to see what everyone will be wearing to Churchill, we took two models on an all-day fashion excursion to Peerless Distillery where we explored the parameters of free-spirited Derby dressing. The style lesson: add your own flavor.